Sierra steak is a cut of beef similar to flank steak, although they come from completely different parts of the animal. Flank steak comes from the belly muscles of the steer. Sierra steak, on the other hand, gets cut from the beef chuck primal, which is basically the shoulder. High-heat grilling is the best method for cooking Sierra steak. The beef industry spent $1.5 billion dollars in the early part of the 21st century in an effort to identify new cuts that would appeal to consumers and command higher prices per pound than ground beef. The Sierra steak, along with about eight other newly named steaks and roasts, resulted from that five-year study. Sierra steaks are produced from a small muscle called the splenius, which is part of a group of muscles known as the chuck underblade, situated directly beneath the shoulder blade bone. Once the splenius is trimmed away from the rest of the underblade (where the Denver steaks, another new cut identified in the study, come from), it needs to have an exterior layer of fat and connective tissue removed. 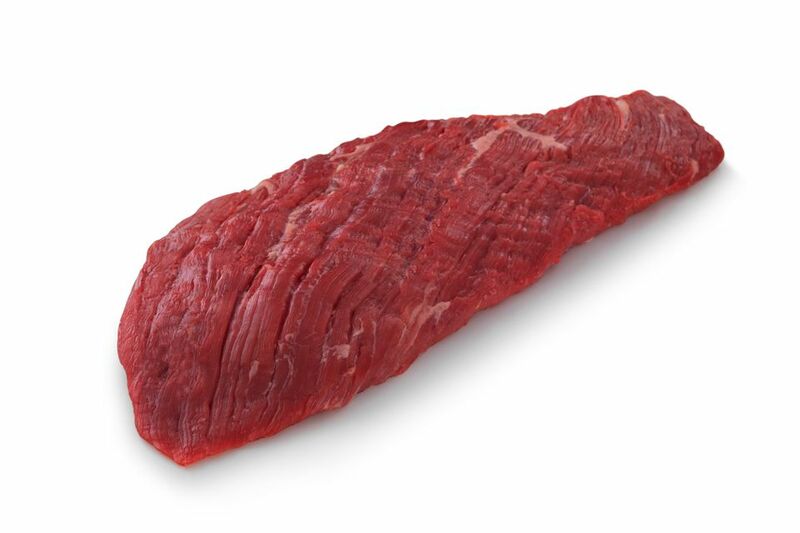 Similar to flank steak, the Sierra steak contains coarse muscle fibers, giving it a pronounced and easily visible grain, which means it can be tough. And like flank steak, Sierra steak is also loaded with incredible beefy flavor. You may even see a Sierra steak called a chuck flank. Sierra steak can be prepared in much the same way as a flank steak: marinate it for a short time, grill it quickly over very high heat, and serve it medium rare. Overcooking makes it tough and chewy. You could sear it directly over the coals of your charcoal grill, which is the highest heat you can probably generate at home, for no more than a minute per side, which, likewise, does not get much quicker. The reason for cooking it quickly is that the longer the steak spends on the heat, the tougher it gets. So your goal is to achieve doneness in as short a time as possible. Next, wrap it up in foil and let it rest for 10 minutes before slicing it. Resting a steak is crucial, but particularly so when using an ultra-high heat method as described here. And since the muscle fibers will still be tough, even though it cooked quickly, be sure to slice the steak across the grain, as thinly as possible, which makes it easier to chew. Another way of preparing a Sierra steak is to braise it for a couple of hours, which will cause those tough muscle fibers to soften up, turning it tender and succulent. What Does Sierra Steak Taste Like? A robust beefy flavor characterizes the relatively lean Sierra steak, which can be tough if it gets overcooked. Though not as readily available as flank steak, Sierra steak can be used in any recipe for the more common cut. After trimming, the average Sierra steak weighs about 1.5 pounds. There is one Sierra steak per beef chuck, and thus only two per cow. This inherent scarcity, along with the cost of the labor required to produce it, means that it sells for nearly as much per pound as sirloin cuts. Beef steaks can be stored in your refrigerator in the store packaging for up to three days. If you want to freeze them, it's best to remove them from the store packaging first. Wrap them individually in fresh plastic wrap or specialty freezer paper, then put them in a large zip-top freezer storage bag. For best flavor, frozen steaks should be used within three months. Use a vacuum sealer for longer storage times. Keep leftover cooked steak in an airtight container in the refrigerator and consume it within two to three days. With about 160 calories and 6 grams of fat per 3-ounce serving, the Sierra steak qualifies for the United States Department of Agriculture lean beef classification. It provides 23 grams of protein, or nearly half the recommended daily value. As with all beef, it's a good source of the B vitamins, which contribute to the health of your red blood cells, and essential minerals such as selenium, phosphorus, zinc, and iron.